Well, I have written about and reported a few fairy-like being encounters over the years...including a leprechaun or two. 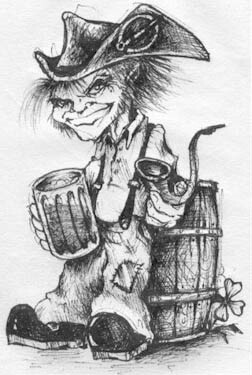 There are also legends of the 'Tommyknockers' in mining areas worked by Irish immigrants throughout North America. After I received the inquiry I looked back through my files, including a few journals I had kept from the 1970's. I did manage to find an odd anecdote that was told to me by a friend-of-a-friend in 1976 while in Philadelphia. From what I gathered an ancestor by the name of Finn, who lived in colonel Philadelphia, had a bit of trouble keeping port wine on hand. It seemed that each morning he noticed that the level of a barrel he kept in the cellar got lower. In fact it had gotten to a point where he thought his wife was taking a dipper full each night while he slept...though he had never known her to have a taste for the stuff. One day while working at the dock he asked his friend Donal what he thought about the situation. Donal looked back at Finn and laughed..."His Nibs is sampling your stock." Finn had no idea what Donal was referring to. "His Nibs...a clurichaun is stealing your spirits." According to Donal, if Finn wanted to see the clurichaun, leave a cup of wine on the night stand...it can't resist an offer of drink. Donal warned "don't scare it away. There will be dire consequences if you do." That night, Finn left a full cup of wine on his night stand hoping to catch a glimpse of the imp. A little bit after midnight Finn heard the floor boards creaking. As he slowly opened his eyes, he gazed upon a small 3 ft. man wearing a red hat made of plant leaves and a red wool vest. It resembled a leprechauns in all it's physical characteristics. As he watched the clurichaun reach for the cup a horrific scream shot from behind him. His wife also caught glimpse of the small being and reacted instinctively. The clurichaun dropped the cup on the floor and dashed out of the room. Flinn thought "what now?" Flinn tried to lure the clurichaun back and to its good graces with several offers of wine, but was never successful. It is said that Flinn could never keep fresh wine again...it always turned to vinegar as soon as it was brought into the house.